can start using Netwrix Auditor without having to provision any hardware or software. 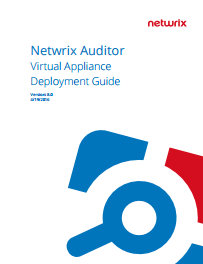 Need help getting started with the Netwrix Auditor virtual appliance? Review detailed instructions for installing and configuring it and start using Netwrix Auditor today. Download free 20-day trial of Netwrix Auditor and deploy it on Microsoft Windows Server. Learn more about how you can deploy Netwrix Auditor in the cloud and gain complete visibility into changes and control over your unstructured data.